A sailor has died after a lifting beam collapsed on to the deck of an oil tanker at a refinery in Hampshire. 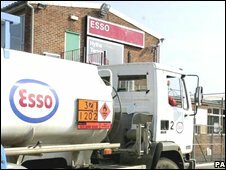 The man, from Honduras, was on board the Spanish-registered MV Castillo de Monterreal which berthed at the Esso refinery marine terminal in Fawley. He was seriously hurt when the hose lifting beam, used to help pump oil on or off a vessel, collapsed on to the tanker's deck, early on Saturday. He was taken to Southampton General Hospital where he died later. Hampshire Police said the man's next of kin had been informed and a post-mortem examination would be carried out on Sunday. The force said it was a "work-related death" and launched a joint investigation with the Health and Safety Executive. The Marine Accident Investigation Branch and the Maritime and Coastguard Agency have also been informed. The Esso refinery on Southampton Water is the largest of its kind in the UK and one of the most complex in Europe. It handles about 2,000 ship movements and 22 million tonnes of crude oil and other products each year. The refinery processes about 300,000 barrels of crude oil a day and supplies about 13% of all petroleum products in the UK.